Diese Website verwendet Cookies. Wenn Sie mehr wissen möchten, können Sie die Cookie-Richtlinien einsehen. Durch das Schließen dieses Banners, das Blättern auf dieser Seite, das Klicken auf einen Link oder das weitere Durchsuchen stimmen Sie der Verwendung von Cookies zu. You can contact us on working days from 9am to 5pm via the contact form or by e-mail (hello@mistertody.com). We will answer your message as soon as possible. Are you looking for the contact details of your favorite store? Search your store via the store locator. On the store page you will find the contact and address details. Go to the article you wish to order. Tip: search via the search function or use the filtering to search for the desired product. Select the desired color and number. Click on the order button, the item is now added to your shopping basket. Check the menu whether you have added the correct items to the shopping cart. In this menu, you can go directly to the cash register or first check and edit your shopping cart via the button at the bottom of the menu. Enter your details and choose the shipping method. Choose the desired payment method. If you have a discount code, you can enter it here. Before placing the order you must agree with the sales conditions. Check the box and click on the button to place the order. You will now be redirected to the payment environment where you can make the payment. If the payment has been made correctly, a success page will be displayed. An order confirmation will also be sent to you by e-mail. Do you have problems placing your order? Contact our customer service via the contact form or via e-mail (hello@mistertody.com) for questions or problems. Do I pay delivery costs? The delivery cost is displayed in the shopping basket before you place your order. Can I exchange or return my online order? We always go for 100% customer satisfaction. Are you not satisfied with the ordered items? You can exchange or return the order within 14 days of receipt. Items ordered online can not be exchanged via the webshop. In that case you must return your order and place a new online order. Of course we always provide a quick refund. When and how does the reimbursement of my return via the webshop take place? We will refund all returned purchases as soon as possible, but no later than 14 working days, provided that the items are undamaged. How do I modify my personal details? You can always modify your personal details via your online account. For this, you have to log in first. After logging in, you will see a link to your account information and your address book on the left. Here you can change your personal details. You can reset your password using the link ‘Forgot your password?’. You can find this link in the login screen. After clicking on the link you can enter the e-mail address with which you have created an account. You will receive an e-mail with a link to our website and instructions to change your password. Do you have questions or problems with your account? Please contact our customer service via the contact form or via hello@mistertody.be. We are there for you every working day from 9.00 am to 5.00 pm. You can change your password by logging into your account. The login screen can be found on the top right of our website. Through the tab account information you have the possibility to change your password. Follow the instructions on the screen for this. If you have any question or problem, our customer service is always at your service. Contact us via the contact form or via hello@mistertody.be. We are there for you every working day from 9.00 am to 5.00 pm. Which payment method can I use? You can easily and securely pay with credit cards from Visa or MasterCard. All MultiSafepay credit card transactions are executed with the support of the 3D Secure program. With the 3D Secure code, a code that only you know as the owner of the card, you are even better protected against fraud and guaranteed safe payment. In addition, your purchases with a credit card are also insured in case something went wrong with your order. To use this payment method, you need a PayPal account. Once you have a Paypal account, you can easily and quickly make the payment with your e-mail address and password. If you have an account with Belfius, ING or KBC, you can pay directly via their online banking system. If you choose this payment method, you will immediately be redirected to the safe and trusted payment environment of your bank to make the payment. Can I pay for my order with a voucher that I have obtained in a store? No, with a voucher obtained in a store you can unfortunately not pay in our webshop. In which countries can the orders be delivered? Orders can be delivered in Belgium, France, Luxembourg, the Netherlands, Spain, Great Britain, Ireland, Germany, Italy, Portugal, Austria, Denmark, Sweden, Poland and Romania. Can I choose the order delivery date? At the moment, it is not possible to choose the order delivery date. We strive to deliver your package within 2 to 4 working days. Of course we find a user-friendly delivery at a time that is right for you important. That is why Sendcloud sends you an e-mail message after you have placed your order. Through this mail you can follow your package or adjust your order. Yes, as soon as your package leaves our warehouse, you will receive an e-mail with the track and trace code of your order. When will I receive my online order? Normally 2 to 4 working days after we received your order. We deliver on weekdays from Monday to Friday, excluding holidays. Where does the production take place? Is your cardboard made of recycled material? Yes, our cardboard consists of at least 70% recycled material. During the recycling of cardboard, the fibers are destroyed in order to be reused. Over time - after a few recycling operations, these fibers are too small to bind sufficiently. In order to obtain a sturdy cardboard, some new fibers must always be added in order to obtain a solid whole. These new fibers always originate from waste material from the timber sector. That is why trees will never be cut down for our cardboard. Is the used ink ecological? Is the ink used ecologically? The ink we use is not water-based, which means that we do not have polluted waste water. Digital printing is done with ink that has fast curing under low energy LED UV lamps. How to assemble my cardboard toy? Learn how to assemble your Mister Tody toy with the help of our detailed instruction videos. If you would still have trouble with your cardboard toy after watching the instructions, send an e-mail to hello@mistertody.com and we will get right back to you. We don’t want you to waste any precious playtime! Why are the toys of Mister Tody made out of cardboard? The cardboard toys created by Mister Tody are not only fun and charming, they are also eco-friendly. For us, it is a conscious choice to avoid plastic in our toys because of its huge negative impact on the environment. Plastic toys are very hard to recycle, partly because they are made of other materials too, such as metal. Mister Tody wants to contribute to the decrease of plastic pollution by offering magical cardboard toys that are easy to recycle and incredibly fun to play with. Will you join Mister Tody in our movement for more ecologically responsible toys? What are Mister Tody’s magical ingredients? Love and craftsmanship. Mister Tody’s toys are all about love and respect, for its producers, its partners and surroundings and for the environment. For us, fair business and quality are essential. We want to constantly work on making this world a wonderful place for our kids to grow up in. 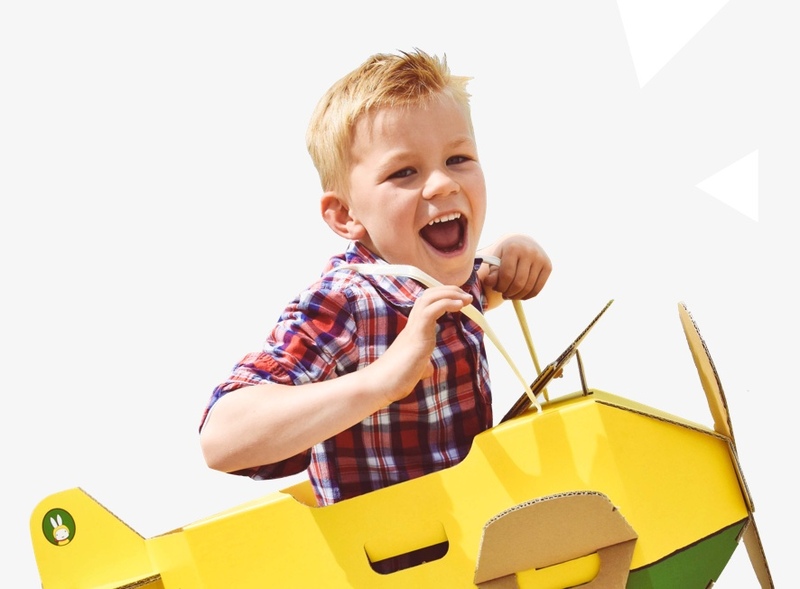 All parties involved in the process of creating our cardboard toys are correctly rewarded for their efforts and creativity. Mister Tody’s products are designed and produced in Belgium, supporting local businesses and local designers. We honestly believe this is essential to our brand and to the magic of Mister Tody. Pappspielzeug, die die Fantasie anregen!